Platform for delivering electronic Messaging Solutions that reinvent the power of SMS & Mobile Alerts. Digital Messaging Platform allows you to do just about anything using SMS,Mobile Alerts, Emails, Voice Messages & Faxes. Keep your Brand Top of Customer Mind. Lower Cost of Alerting by Switching Smoothly from Costly SMS Alerts to Cost Effective Mobile Alerts. Scalable Operator/Enterprise Grade Platform that can run from 5 SMS/Sec to 300 SMS/Sec and more. Drastically improve the way you do business. P2P,A2P,E2P, Marketing. Alerting platform an enterprise solution by aggregating data and alerts from multiple systems,consolidating consumer preferences; presenting new and existing alerts, and managing personal preferences in an Omni-channel environment to help build consumer trust and increase profitability. Flexible platform: Reduce time to market, operational costs and product complexity by augmenting any existing systems across channels and existing mobile OS's with Enterprise Alerting. Expanded Alerting Capabilities: Aggregate alerts from multiple systems and data sources, and deliver consolidated consumer communications in real-time to optimize alert preference management and improve the customer experience. 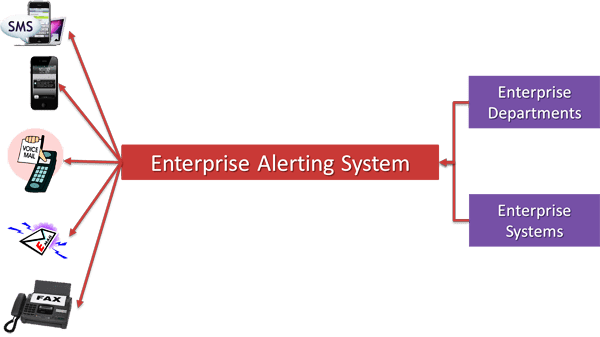 Expanded Alerting Capabilities: Implement Actionable (two-way) alerts along with the traditional Notification (one-way) alerts based on business needs. Centralized Customer Preference Management Across Channels: Central repository within your organization for cross-channel customer preferences. Easy and Fast Creation of Alerts: Centralize alert development and rapidly deploy new rules and alerts. Multi/Omni-Channel Engagement: Offer alerts across SMS, push notifications, email, voice, and fax.